We are upgrading about three kilometres of existing water supply pipes in the Kew area, to ensure customers are continuing to receive a reliable supply of drinking water. Some of the existing water supply pipes in the Kew area are up to 100 years old. Upgrading these water supply pipes involves having a construction contractor doing work in some local streets. Our contractor, MFJ Constructions, is replacing or renewing three kilometres of existing pipe, which are mostly located beneath the road surface. Construction activities are moving along as sections of pipe are upgraded. This means that the contractor is only working in the same location for 3-5 weeks before moving further along the street. The red line shows where new pipes will be built. The blue line shows completed sections. Construction started in mid-May 2018. The works should be completed in June 2019, subject to good weather and ground conditions. MFJ Constructions is working between 7.00am and 5.00pm, Monday to Friday, and Saturdays between 7.00am and 1.00pm. Local water and sewerage services will not be affected by these works. Despite our efforts to minimise the impacts of these works on the community, local residents will at times notice construction noise including concrete cutting saws, and vehicle movements. As these works will involve working within the roadway, there will be road closures and restricted access at times. This will help us complete our works sooner. A traffic management plan is in effect to ensure workers, pedestrians, cyclists and motorists are safe. Local schools have been contacted in advance to best coordinate student drop-offs and pick-ups. Footpaths will remain open to pedestrians throughout the works. The work site will be fenced off to ensure the safety of our work crew and pedestrians. Road closures will only be in effect during work hours. Roads will be open as usual overnight and most of the weekend. 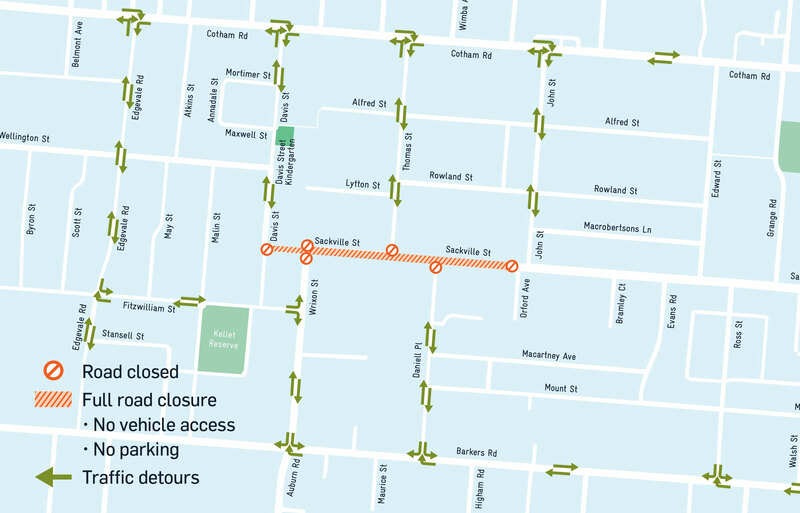 There will be changed traffic conditions along Sackville Street, from Davis Street to John Street, between Monday 26 November and Friday 14 December. 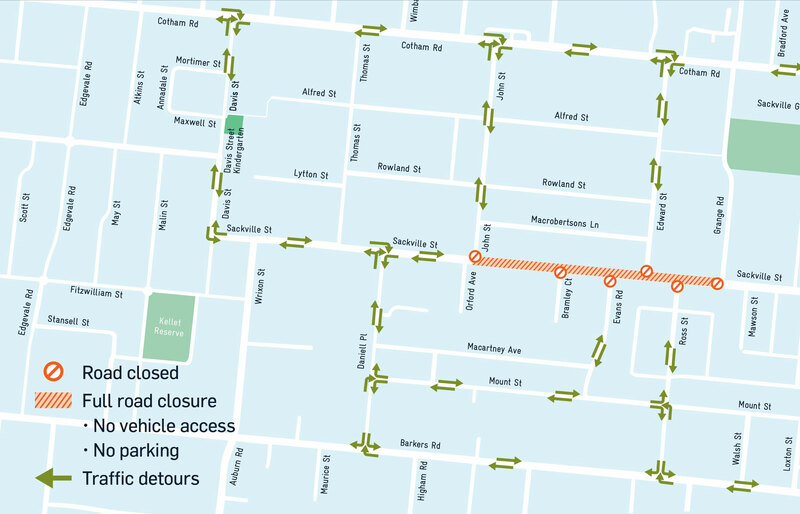 Please note: all vehicle access and on-street parking will be removed along Davis Street (Wellington Street to Sackville St) during this time. 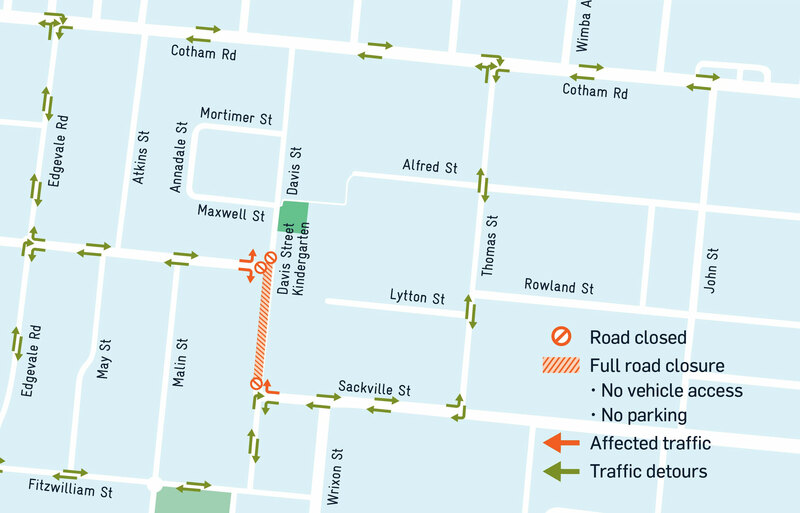 There will be changed traffic conditions along Sackville Street, from Davis Street to John Street, between Monday 17 December and Friday 22 February. Please note: All vehicle access and on-street parking will be removed along Sackville Street (Davis Street to John Street) during this time. 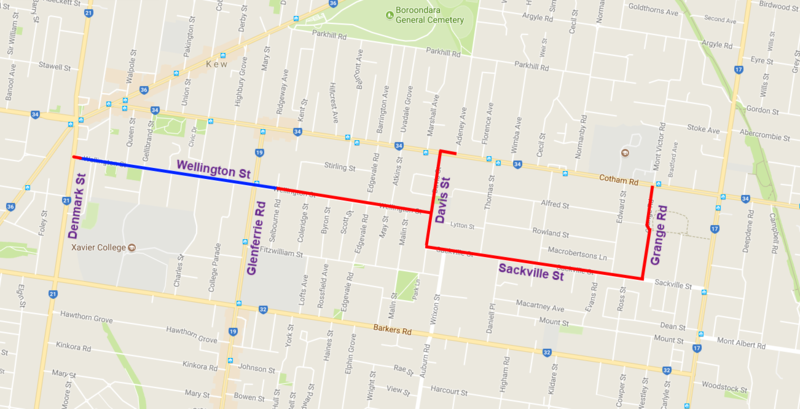 There will be changed traffic conditions along Sackville Street, from Davis Street to John Street, between Monday 17 December and Friday 22 February. Please note: all vehicle access and on-street parking will be removed along Sackville Street (John Street to Grange Road) during this time. Drivers will not be able to turn from Sackville Street to John Street.